Maybe the USDA will get it right this time. 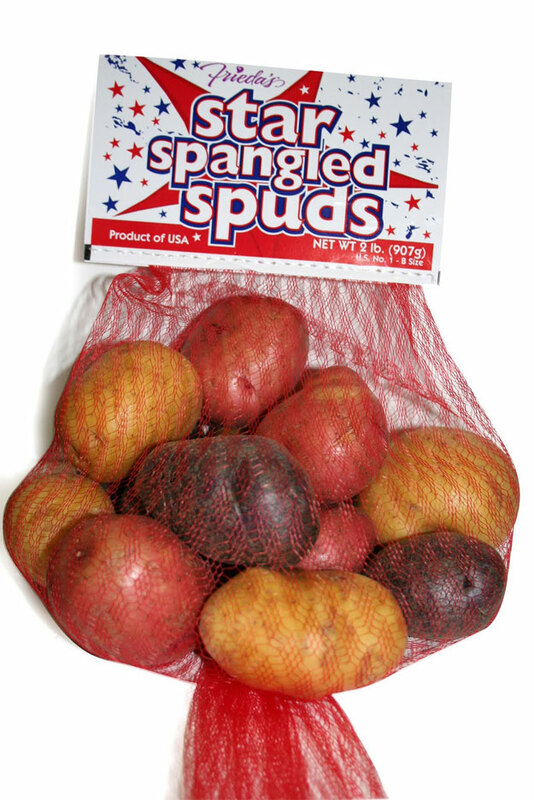 They struggled with making revisions to the US Grade Standards for Potatoes back in 2008, issuing changes in April and once again in November. This time around they are attempting to clean up their mistakes, and for the most part they seem to have it right. Click here to see the proposal. A couple of notable changes, the revised standard will now allow mixed varieties or types to be include when designated as a specialty pack. Mixed colors makes sense, allowing for reds, and whites to comingled in the same pack, but allowing for mixed varieties (ie.-Superiors and Atlantics) to be comingled may be another matter. I am sure the potato industry will weigh in with their comments. Cleaning up the tolerances for quality defects makes sense. Why it took 3 years to correct this mistake is alarming. The current standard allows for 5% external quality defects at shipping point, but at destination the tolerance is increased to 7%. Why? Quality (permanent) defects do not change or become worse, so why allow more at destination? This made no sense. If an inspector found 7% quality defects (sunburn and misshapen) at destination, at the receiving warehouse, the lot would be in grade. But if these same 7% quality defects were found by an inspector at the packing house, before the potatoes were shipped, the lot would have been out of grade. The proposed revsions addresses this anomoly, with no more than 5% quality external defects and 5% quality internal defects being allowed at both shipping point and at destination. The guideline for scoring sprouts is being changed back, to the way it was, prior to the debacle that took place in 2008. In 2008 the USDA changed the scoring guideline for sprouts, as being damage when more than 5% of the potatoes have individual sprouts longer than 1/2 inch in length, at destiantion. This meant if a potato had numerous small sprouts, or peepers, scattered all over the potato it still was not a defect, because no one sprout or cluster was longer than 1/2 inch in length. This will no longer be the case. Now, as proposed, a potato with an individual sprout longer than 1/2 inch in length will still be scored as a defect, and any potato with individual sprouts or clusters of sprouts that materially affect the appearance of the potato will also be scored as damage. 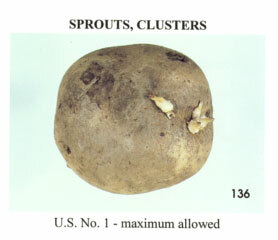 This visual aid has been in place for years, as a guideline for the maximum allowed for a cluster of sprouts for the US No. 1 Grade. I don’t know if they have been ignoring this visual aid since 2008, but at least one is already in place. The USDA will have to create some additional visual aids, depicting numerous sprouts on a potato, showing what is allowed and what would be considered a defect. I did notice one oddity the USDA failed to address. The current standard allows for 1% soft rot (decay) for the US Commercial Grade, while the standard allows twice as much soft rot (2%) for the US No. 1 Grade at destination. Since the US No.1 Grade is supposed to be the best grade, the highest attainable grade for potatoes, it makes little sense to me why the USDA would recommend twice as much as soft rot for the US No. 1 Grade. Maybe three years from now the USDA will straighten this out.